Motion Ride is a new French suspension fork company that has taken a fresh piece of paper to design a fork from the front hub up. The main design brief? Create a fork that doesn’t dive. 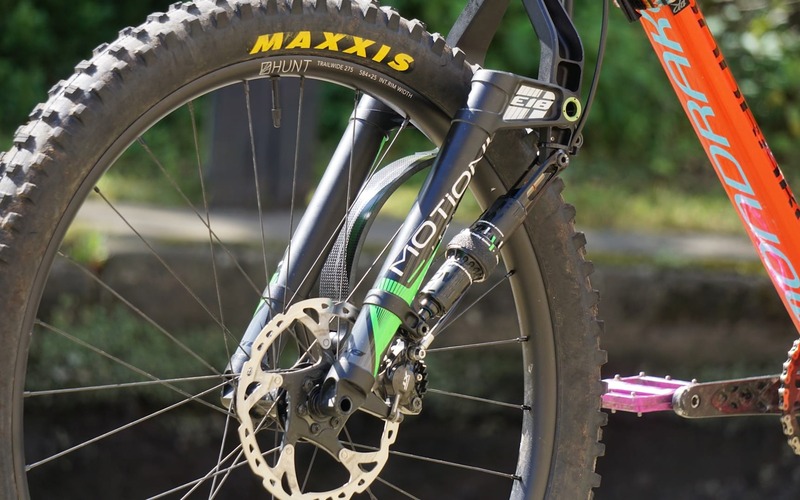 After determining out that it could indeed build a fork that resists diving (both under pedalling and braking forces), Motion Ride turned its attention to creating a new suspension medium along with a low friction damper. As well as building a fork with anti-dive properties, they decided it would also be possible to build a maintenance-free product. Yes, ‘maintenance free’. We were intrigued by that too. According to Motion Ride, it wasn’t able to achieve all of this with a traditional telescopic fork. Instead, what we have here is a linkage fork, one that incorporates a carbon beam and damper that work under extension (NOT compression), and supposedly friction-free bushings that Motion Ride claims don’t need lubrication. 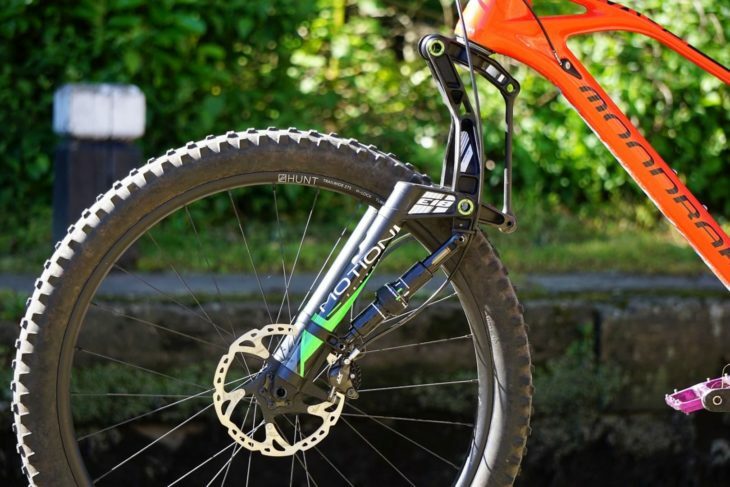 It’s not only technically very different from every big brand suspension fork on the market today, but it’s visually very unique and judging by comments on social media this might be Motion Ride’s biggest hurdle. Riders are so used to a traditional telescopic fork that they might not be willing to try a linkage model – regardless of any purported benefits. To those people, I say “more fool you”, because the E18 is well and truly a surprise performer. You may need to adjust your hose to fit your brake caliper. 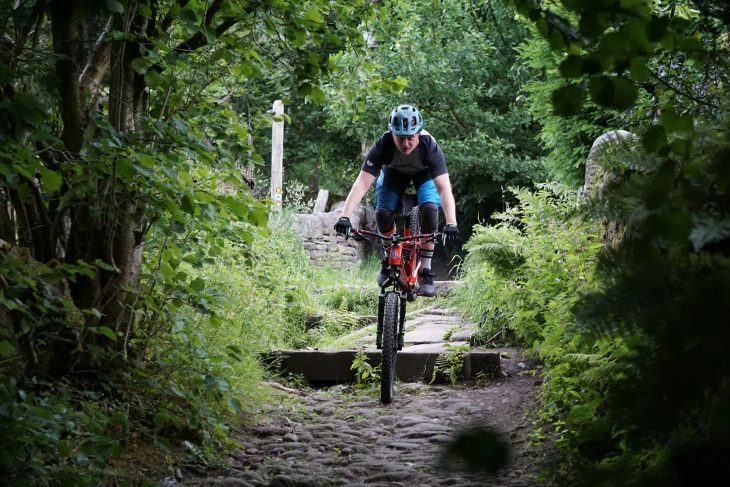 Motion Ride invited us to test its new fork in France, but as we would only have a day with the fork on unfamiliar terrain, we decided to get Motion Ride over to Todmorden instead so that we could get a real feel for it compared to a standard fork on our local trails. 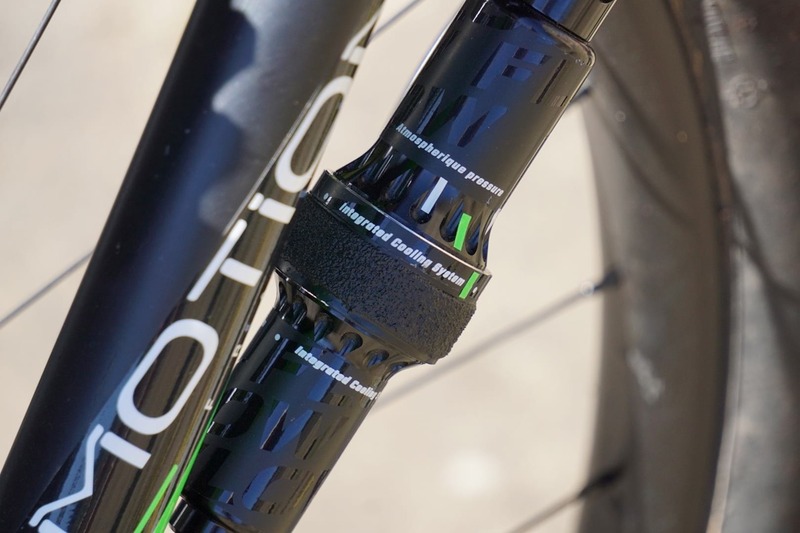 If you’ve already read through my previous Motion Ride E18 article, you’ll already know most of the technical details of the fork and will have already spotted that it uses a standard steerer tube. Despite its visual complexity, fitting the E18 to our Mondraker Foxy test bike was super duper easy. It is worth noting that when fitting the Shimano XT calliper to the fork I did have to reposition the hose banjo to prevent it fouling on the lower pivot point. Other than that, installation was plain sailing. I was given the option to test either a 150mm or 160mm version of the fork and decided on the 150mm as I’m a firm believer of quality of travel over quantity. 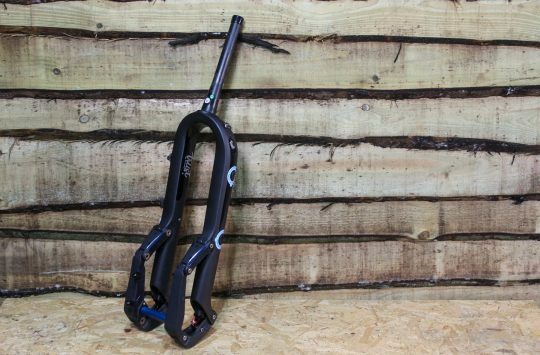 Surely if the E18 performed as well as Motion Ride says it would it would feel as good, if not better than the 160mm travel Fox Factory 36 that I had been running shouldn’t it? Preload is adjusted to suit rider weight. In advance of arriving with us at Singletrack Towers, Motion Ride had asked about my weight and had adjusted the fork accordingly. Interestingly, Motion Ride states that their carbon beam spring, or ‘Wave’ as they call it, is designed for all rider weights. A 6mm bolt under the fork changes the preload of the Wave, so sag can be set correctly for anyone. 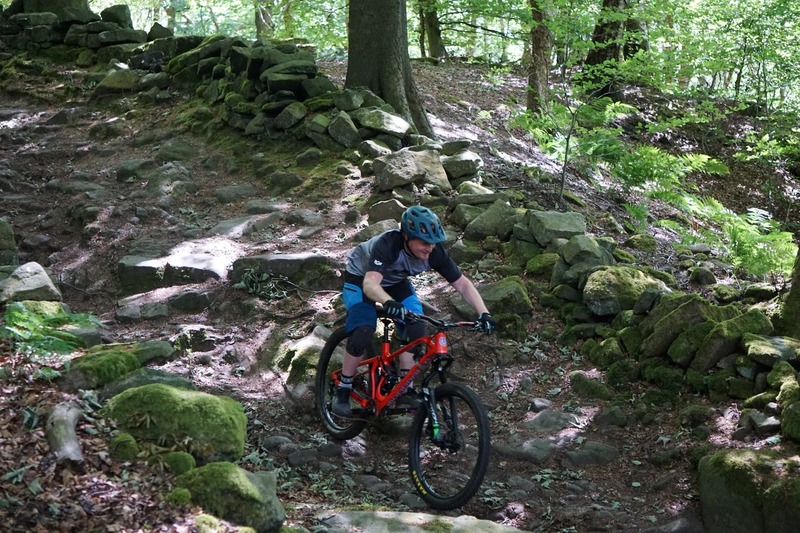 With that single setting adjusted we rolled out on to the canal and made our way to our local trails where the E18 would be tested on steep descents, through rock gardens, off of jumps, and generally thrashed as much as I could in a day. After a few hundred meters of bunny hopping and jumping off of locks I realised I’d like a tiny bit more rebound. 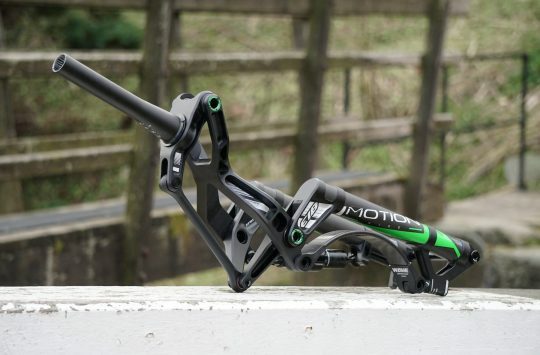 The Motion Ride damper aka “Curve” offers two modes. Turning it anti-clockwise gives you more rebound while turning it clockwise firms it up, a position we didn’t have a chance to test. I wound rebound on by 1 click and left it there for the rest of the day and it rode spot on. 1 click of rebound was the only adjustment I made. Our first port of call was a fast, rocky downhill trail with hairpin corners and a few options to hop from rock garden to rock garden. But to get there we had some faster smoother terrain to travel through which gave me plenty of opportunities to test the E18 while sprinting out of the saddle. It was instantly evident at just how well the Motion Ride E18 handles forces such as pedal induced bob or diving. The Foxy picked up speed, the front end stayed sat up in its travel and I was in the perfect position to pedal faster, and faster, and faster. Once into the actual rocky fast section of trail the E18 continued to just get on with the job of soaking rocks and roots. The front wheel tracks over terrain amazingly well and encourages you to ride faster. The starting stroke is ridiculously smooth on this fork. As the E18 doesn’t dive and has an impressively stable mid-stroke, I soon found that I was leaning further and further forward to get even more weight over the front end. This allows the rear to dance over terrain and actually boosted the playfulness of the Foxy while increasing stability and top speed. Climbing back to the top was an eye-opener too. The low friction design of the atmospheric damper and “zero maintenance” bushings make for a very smooth ride. 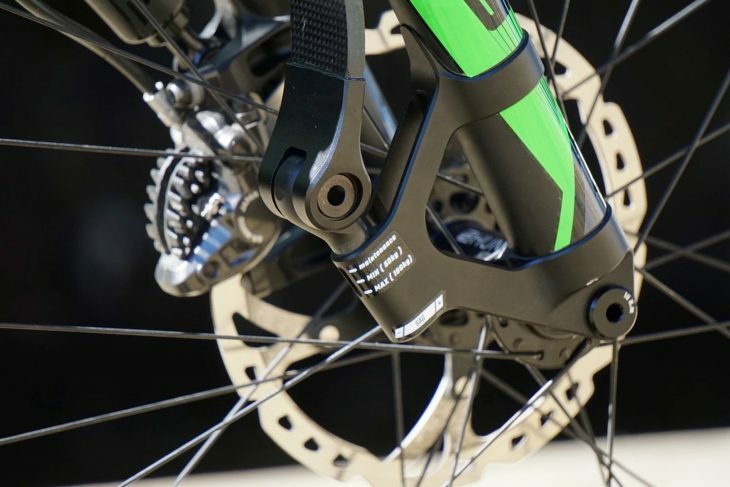 Whereas most telescopic forks require a degree of force to break through any initial seal stiction (which can impede small bump performance), the E18 instantly patters overs any trail imperfection. We moved on to rougher terrain where we could really gain some speed and plow into rockier terrain, but the E18 just came back for more. In fact, I soon realised that the E18 was handling hits so well, that I was able to watch the trail more carefully, choose new lines and even decide if I wanted to hop over the upcoming section or simply smash through it. Tracking in corners is impressive. In steep sections the anti-dive action allowed me to keep my weight centered and enter berms at speed. And for those times when I did overcook it, the linkage fork was a little more forgiving if I did have to tap the front brake, because I had to test if it dived didn’t I (never tap the front brake on steep scary trails kids!). For those of you looking at this odd linkage fork worrying that it would simply collapse on a hard landing, or can’t be as laterally stiff as a standard fork then don’t. Landing front wheel first off a fast drop (see the photo below), riding hard into roots and charging through rocks proved to me that the E18 has been engineered with hard riding in mind. The E18 handles heavy front wheel landings with ease. 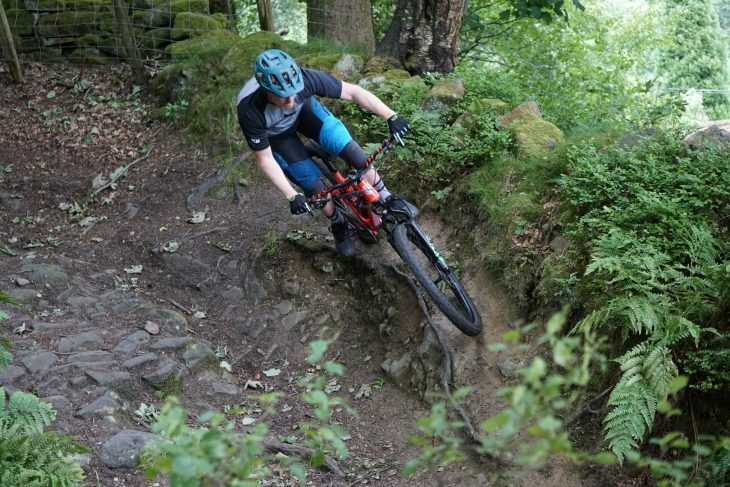 The fork reacts stupendously well regardless of the velocity you’re traveling at, making it not something that only top riders racing at warp speed with benefit from, but anyone wanting class-leading suspension performance can appreciate. I believe the fact that each photo of me riding the Motion Ride E18 has a beaming smiling in it is a telltale sign that I thoroughly enjoyed this fork. Not only does it offer quality travel, it has you searching for more advanced lines than you would normally consider. Bonkers looks, and so far, bonkers performance. Keep in mind though that this is a 1-day ride first impressions and not a complete, in-depth review. I still need a lot longer on the Motion Ride E18 to test the fork in a range of environments and across a section of different terrain before finally committing to a conclusion. I also need to thoroughly test the fork to ensure that Motion Rides claims about maintenance hold up, however first impressions are promising. Hopefully, we’ll be getting a review fork in September once production models are released, so look at for a full review later in the year. Fascinated by this. Will have to ride one. Fair play being able to land a 4″ drop with the rear wheel 12″ in the air! Must have taken some skills lol! I don’t care how it looks. It makes so much sense. 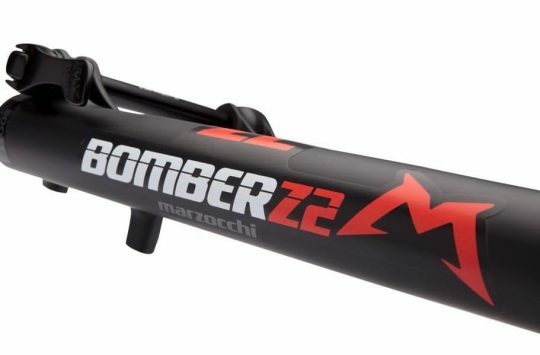 Really want one but after checking the price its to much of a punt on something that is not established yet. Hope they do well get some scale and prices will come down for me to pick one up. Curious how well those non-replaceable bushings are going to last in UK slop. September been and gone… Any follow up on that one? @IvanMTB Apparently high demand has delayed availability of our test fork. We’re hoping to receive it in April now. maintence free fork has maintainence setting.